This old-timey looking wooden rubber-band pistol has a ratcheting hammer that lets you load several rubber bands at once. Comes with (6) rubber bands, but you know how rubber bands are--they're everywhere. 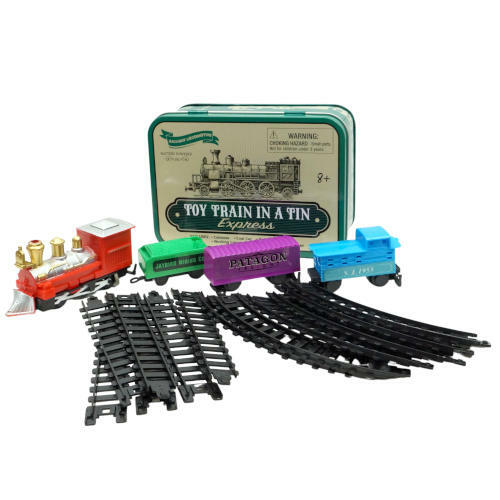 More fun than a canned ham, this flip-top storage tin has a train set inside, with a plastic steam engine, tender, boxcar and caboose, as well as a 12-piece track that forms a 10" x 22" oval. You add a "AA" battery and you're the engineer. Good clean fun for trips to the beach or pool. 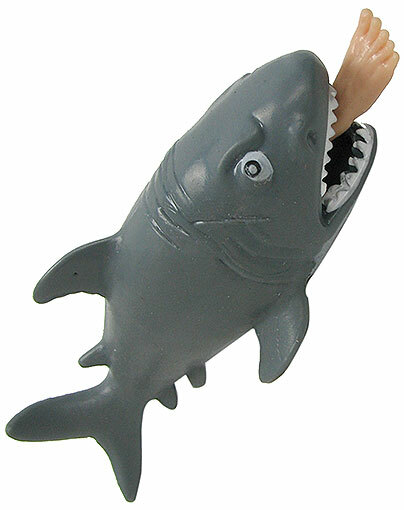 This 4-3/4” rubber shark has a small human foot sticking out of its maw. Give him a good squeeze and the leg pops out up to the shin. Quickly repeated squeezes make it look like the shark is having lunch. Spin the ribbed 7" handle of this hand-powered prop between your palms, and watch it take off. (If it lands instead of flying off into the wild blue yonder, reverse the spin!) 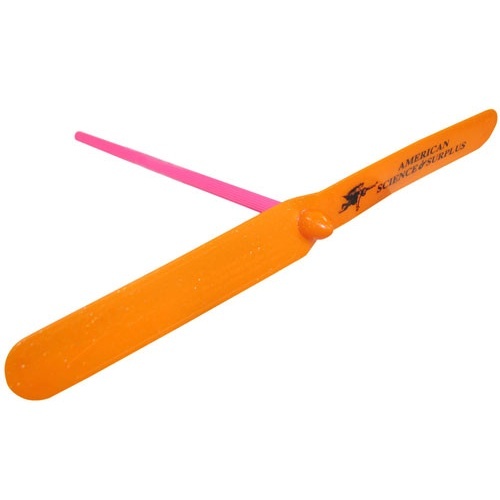 Neon handle, bright, metallic-flaked 8" propeller, and a lift so high we imprinted it with our logo - the airborne Jarvis. It's all plastic, and won't decapitate anyone, but it's still for 10-year-olds and up. Introducing the Aeromax 2000. 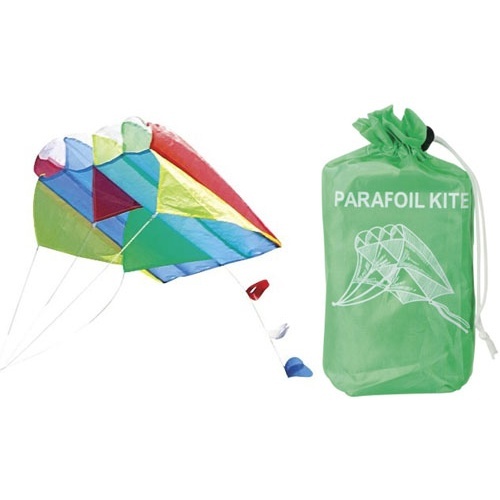 This update of the classic parachute toy has mesh under the canopy instead of lines, so it's tangle-free. Big 20" chute floats the little 3-1/2" tall trooper gently to the ground. In assorted colors, which we'll pick because we have really good color sense. Why, when we were your age all we had to play with was a stick and an old tin can. 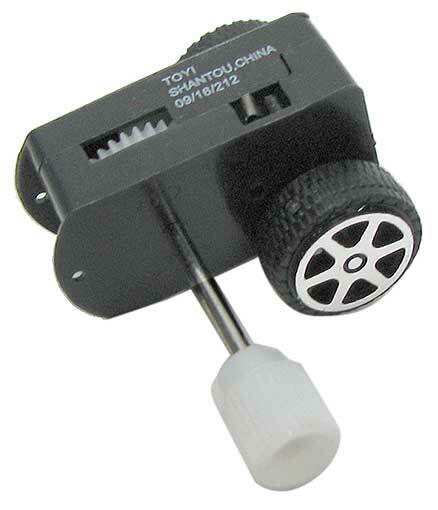 But never mind that--now you too can make your own fun in the form of actual wind-up toys with this small wind-up motor with an attached pair of 9/16” dia wheels on a 1-1/8” wheelbase. The winding shaft is 1-1/8” long and the whole shebang measures 1-1/4" x 5/8" x 1/2" and has a good long running time of approx 10 seconds. 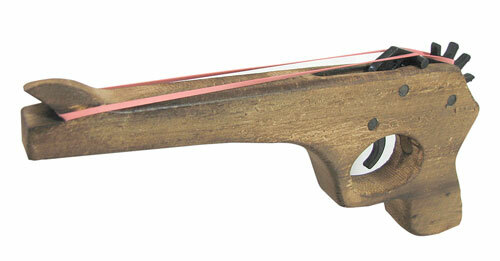 Behold our version of the gravity-fed sliding woodpecker. 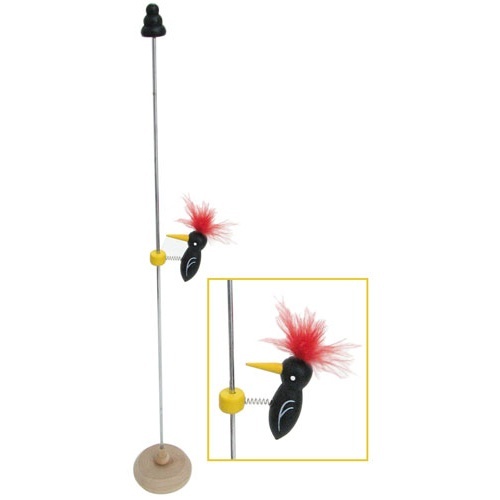 Ours is a 1-3/4" standard black woodpecker, not counting his cute red plume, slowly pecking his way down a 16-1/2" tall metal rod. His super-rapid, lifelike pecking action is strangely compelling to adults, and draws belly laughs from toddlers! AKA hand boiler. An exotic bit of hand blown glass with a bulb at top and bottom connected by some zippy tubing that spirals, loops, and/or jogs. In the closed system is some colored liquid (methylene chloride) that is very light. Hold the lower bulb in your hand and as the liquid is warmed it pushes through the loops to the upper chamber. When all the liquid is pushed out of the lower bulb, expanding air will bubble through the tubing making it appear that the liquid is boiling. WARNING! The glass is fragile and the liquid is nasty. If you drop the thing on the kitchen tile, it will eat the finish off the tile and the stain in the liquid will permanently stain the floor, so don't let kids handle this item unsupervised. About 7" tall, it is a favorite in our stores. Go fly a kite. 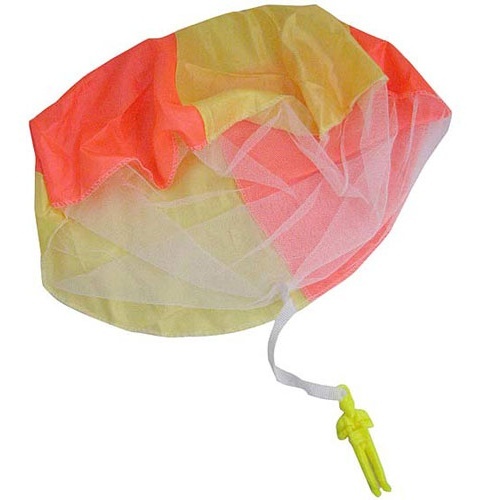 We highly recommend this rainbow-colored nylon parafoil version, measures 20" x 23" at its widest with a 14-foot tail (over three times longer than a tiger's) on a spindle with a couple hundred feet of string. Includes a carrying pouch, too, making it a very practical, portable parafoil. If you remember that poster, you’re really old. 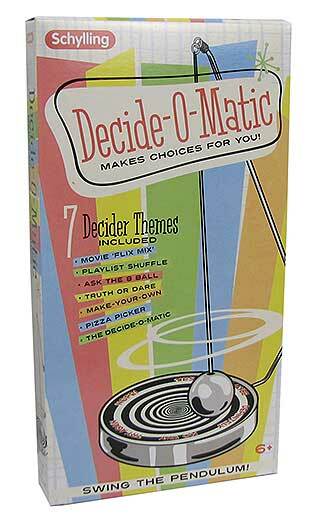 Today’s generation just grabs the Decide-O-Matic, which lets it decide for them. 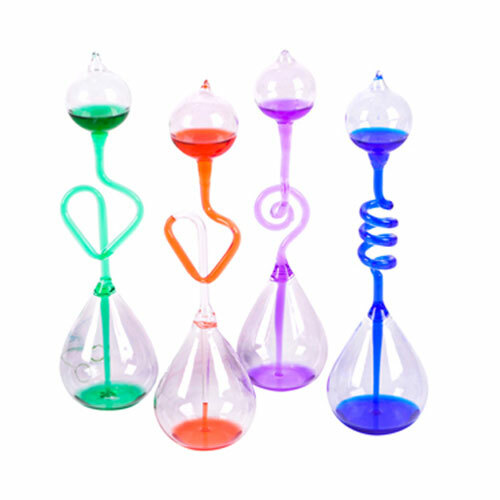 Like the Magic 8-Ball, but with more options and more fun via a pendulum and magnet. Select a Decision Disc--fortune teller, truth or dare, movie “flix mix,” pizza picker or playlist shuffle--then set the pendulum swinging and watch it lurch from choice to choice before settling on the one that relieves you of the burden of decision-making. Includes a blank disc to add your own custom quandaries. 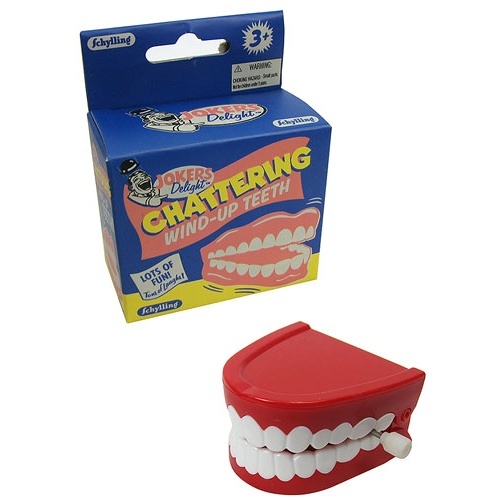 THE American classic novelty item (even ahead of the whoopee cushion and rubber vomit, we think) is a set of chattering choppers. Auto-dentures. Invented by Eddy Goldfarb in 1949, a man who made the Toy Industry Hall of Fame ahead of Milton Bradley, these are, not to put too fine a point on it, the sine qua non of gagdom, the ne plus ultra of spring-driven frivolity. Ours are 2-1/2" dia, with a wind-up key.